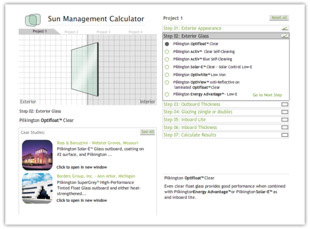 This calculator is a handy interactive tool for calculating the Solar, Optical and Thermal properties of our most popular glazing combinations, and will even generate 3-part CSI format custom glass specifications for each, ready to incorporate into your project specifications. The Pilkington Sun Management Calculator is now available on all web-enabled devices, including tablets and smart-phones. This calculator will help you determine if you need to heat treat different types and combinations of glass under different conditions to resist breakage from solar induced thermal stress. 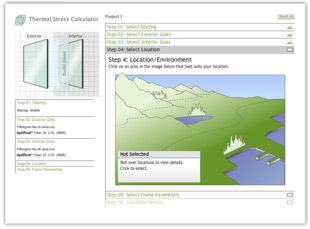 With single and double glazing options, the Pilkington Thermal Stress Calculator offers a wide variety of glazing combinations. It even accounts for the building’s location and shadows from overhangs. The Pilkington Thermal Stress Calculator is now available on all web-enabled devices, including tablets and smart-phones. Free mobile app available now!